Free tool joins multiple Outlook PST data files. This free tool joins multiple Outlook PST data files. - Merging your PST files is safe. The utility changes nothing, but only creates new PST files. - Works with PST files of any size supported by Outlook. There are no limits on the number of folders and messages. - If necessary, splits the combined PST files into pieces by size. - Provides a filter by folder type. For example, you can merge only Outlook contact folders or only calendars from different PST files. - Can skip or replace duplicates. This allows you to merge the same PST files several times, skipping duplicates in new files. This mode is useful for backing up multiple PST files. - Supports macros in names of stored files and folders inside PST files. For a merged PST file, you can specify a folder name; the utility will create folders from source PST files in this folder. - Skip deleted items. To avoid copying redundant data when merging PST files, you can skip deleted items. Here, the "Deleted Items" folder and all its subfolders will be skipped when merging PST files. - Detailed report on the results. After the merge is complete, you will receive a report that shows how many items have been copied, skipped, or replaced for each PST file. 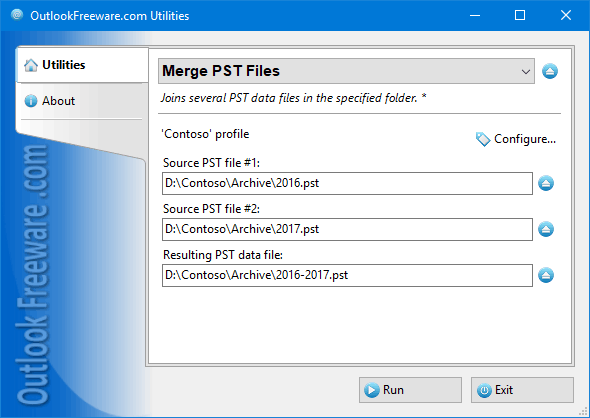 - To merge multiple Outlook PST files, select a folder with PST files on your disk or network share, specify the name of the combined file to be created and run the utility. Enable the subfolder processing mode, the path to the folder in the new PST file, the modes of skipping deleted items and duplicates, and set the filter by Outlook folder type. You can also limit the maximum size of the created PST file - in this case, several files may be created. Using the command line in batch files and scripts allows you to automate the merging of PST files, and to perform scheduled operations.